TAOB Pt.2 – Part 2 of The Antechamber Of Being trilogy is nearing completion, the last few guitar and vocal parts are currently being recorded leaving only the somewhat monumental task of mixing to be done. Once again Simone Rossetti fills the lead role as the main character The Dreamer, with Bekah Comrie, Phil Allen and myself also reprising our respective roles. There will also be a very special guest vocalist to be announced soon. The estimated release date is Apr/ May of this year with a fund raising campaign (incl sneak preview) to be announced over the next few weeks. Update – The Kickstarter campaign was successful, the funds were raised to publish my storybook and my lucid dreaming fun tools!! Thank you everyone for your support. The Cupboard Of Fear is aimed at teaching children (and adults!) to overcome their nightmares with lucid dreaming – plus – my new reality check tools will help you remember that all important lucid dream induction exercise. Click here for more info on Stewart Bell’s lucid dreaming site. 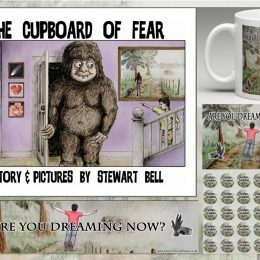 The Cupboard Of Fear – A storybook aimed at helping children (and adults!) to overcome their nightmares by teaching them how to lucid dream. The story is based on my own experience at 6 years old and tells how a recurring nightmare I had as a child, about a monster living in the cupboard at the bottom of the stairs, prompted my older brother to teach me how to realise when I was dreaming and then how to face up to the monster from within the dream. The events from this storybook are chronicled in the opening track “Decoherence” on the first album. For more info on the storybook, the lucid dreaming tools and how to support this ongoing project please click here to visit my Kickstarter page. Thank you.